Choosing furniture items that kids can grow up with helps extend the lifespan of your purchases. If space allows, consider a full or queen bed in lieu of the typical twin kid’s bed. If space is at a premium, bunk configurations include full over full, or twin over full. These arrangements can be fun but will of course be temporary. Don’t forget homework area and technology, and whether a bedroom computer is appropriate and at what age. For other spaces in the home, always think safety when it comes to furniture selection. 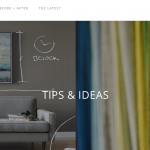 Avoid furnishings with potentially hazardous sharp corners or protruding hardware. Always secure tall furniture to the wall to prevent tipping over and possible serious injuries. 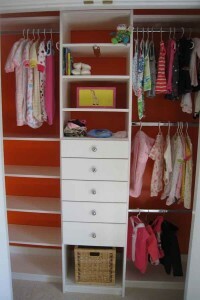 Flexible and adjustable storage for clothing is a must during the ages that small children begin to dress themselves. Closet systems can be two or three levels for hanging, and built-ins or bins can help tame storage of small objects. Hooks are also great for little hands to reach. Hanging storage units for the closet can offer some highly visible organization. I never thought toy boxes were the best storage option. Drawers or open-front stacking crates seem much more useful. Most important when selecting finishes and materials for kid-friendly spaces is choosing surfaces that are durable, easily cleaned, and not susceptible to damage through daily and casual use. Selecting materials that will be especially easy to keep looking their best helps to minimize distress when cleanup is needed. 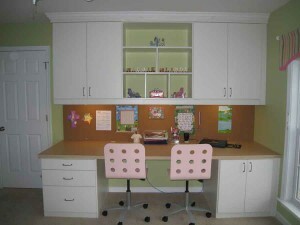 See next post for kid friendly fabrics and finishes for walls and floors.